Home › Uncategorized › Writer’s Challenge and Opportunity! 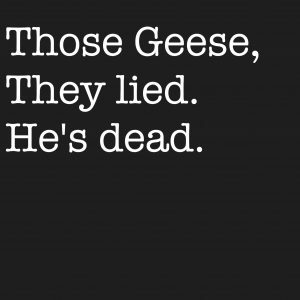 Those Geese, they lied. He's dead. And why I won't bore you with how they came about, I do want to excite you with the idea I had to put out a challenge to you all. What if you wrote a short story (2000-5000 words) based around these six words in some way? What if there were a dozen authors who did it, each coming up with their own unique way and tale? 1 – Using these six words as a basis (could be loose or literal, it doesn't matter!) write your own short story – this opportunity is open now until June 2016. The last submissions need to be in by 1st June 2016. 4 – Confirm that you agree to the disclaimer written below. If you do not, you are freely allowed not to submit. Best of luck and get creative! Any further questions, just drop me a line! I'll make sure to tweet all successful authors once the book is ready. Disclaimer: I cannot guarantee any entry will be accepted. As this is an invitation to participate, you do so freely and I do so under no obligation. I will state that I don't expect to have loads of replies, and therefore if your story is good enough, it's most likely going to be included. And by good enough, I mean interesting, not terrible. I'm not setting some super high standard. I'm doing this for fun and as a creative experience. At the end of it there will be an eBook available (all participants will be sent their own copy before hand to approve etc). I will make the eBook free for five days every 90 days (as per Amazon usual promotions). This will help you get readers from your following for the book (which includes your work, of course). I do not expect this book to make large sales, if any. It will be done as a service for all the authors involved and will be free regularly. If however there are any royalties, these will go towards the work put in by Tim and will be retained by him. ‹ Can You Write With Things On Your Mind?